If you can see this post, I guess the transfer to Blogger Beta was successful. Over the past few months, since Google bought Blogger, there has been a lot of pressure on us Blogger accounts to switch to the new Google Blogger Beta interface. It's looking to me like it will soon become compulsory, so I'm going to go ahead and switch today. I am assured that switching from Blogger to Blogger Beta will not result in my blog being lost, changed, or moved. But you know how these things go. If the blog disappears, look for me on strippersguide.com to learn where the blog has moved. 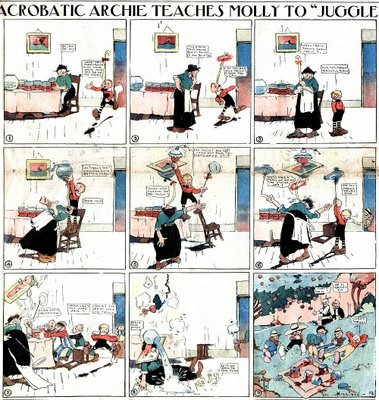 When George Herriman started working for the New York World, essentially his first steady cartooning job, Acrobatic Archie was the third continuing series that he created. It ran from April 13 1902 to January 25 1903. I'll be perfectly honest and say that I see no hints of future greatness in this early work; in fact, I'm flabbergasted that the World would let something this badly drawn appear on the front page of their comic section. The drawing is sloppy and amateurish, the lettering is atrocious and the gags are pretty well standard kid strip fodder. About the only positive I can come up with is that Herriman's early drawings are nothing if not lively. His figures all look like they have no bones -- their limbs twist and curl and stretch like they were made of rubber. This quality disappeared in his later work, replaced with a stiffness in his human bodies that was more acceptable to the cartooning standards of the time, but looks awfully dated today. Not surprising, then, that Herriman's masterpiece Krazy Kat starred animals, while Baron Bean and Us Husbands are interesting more as curiosities than great strips. A note about the sample. I scanned an absolutely gorgeously preserved 1902 World Sunday section for this post, but for some reason my scanner managed to find every little imperfection and magnify it. Sorry it doesn't look better, folks. What I find amazing with these early comic-strips is that the dialogues are written really tiny. Obviously, the words have to be written larger because of the shrinking comics space, but I think even if comics were printed bigger, I would still have trouble reading them. The captions are readable, if sloppy, at full size on the page, but pretty much any reduction makes it tough. The cartoonists had the advantage then of knowing the exact reproduction size they were working for, so the lettering was no bigger than necessary for the format. Some of those early strip creators were really sloppy with their lettering. McCay is infamous for his careless lettering. Were there professional letterers back then? Opper wasn't a great letterer but I find his style charming and appropriate for his strips and cartoons. For cartoonists based at newspapers there were certainly people in the paper's art bullpen who were expert letterers (many photos and diagrams included hand-lettering in those days). But I guess the cartoonists were too low on the totem-pole to be allowed use of these guys. Why the papers stood for all this sloppy lettering is one of the great mysteries to me. Here's a real oddball. E.E. Edgar's Famous Fables was a self-syndicated newspaper column on weekdays, and a color comic page on Sundays. The feature tells amusing anecdotes about famous people - both current celebrities and historic personages. The daily version, as far as I can tell, was not illustrated. The Sunday sported cartoons by Homer Provence, whose style owed a lot to George Lichty. Provence was pretty lazy about his cartoons - they really only relate to the anecdote, not the famous characters involved. I guess he couldn't be bothered to work up caricatures of the subjects, nor illustrate the times being discussed. Thus all of our subjects, be they William McKinley or Samuel Johnson all pretty much look like Senator Snort in variously colored suits. The feature, at least the Sunday page, seems to have started sometime in 1947. The Chicago Sun-Times provides a likely end date of 9/17/1950; they were probably Mr. Edgar's biggest client, and their cancellation would have been a killing blow to the bottom line. Here's a really neat batch of material from late 1939. Victor Fox, grand poobah of the Fox Features comic book company, decided that his comic book material would be an excellent addition to the nation's Sunday newspapers. He staged an extensive marketing campaign in Editor & Publisher, which I have gathered together here, and am presenting in chronological order. Now as far as I know, all the Fox Features newspaper offerings actually started running in January 1940, but the marketing tries hard to give the impression that it was already in newspapers in 1939. However, a close reading of his impressive circulation claims reveals that he is talking about his comic book sales, not newspaper syndication. If anyone has evidence that any Fox material was running in newspapers prior to January 1940, I'm anxious to hear from you. By the way, take the list of titles with a healthy dose of salt. 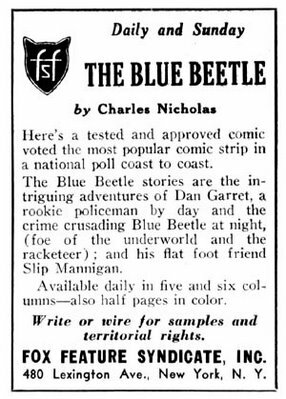 The only titles that ended up appearing in newspaper syndication, as far as I have been able to document, are Blue Beetle, Doctor Fung, The Flame, The Green Mask, Patty O'Day, Rex Dexter of Mars, Secret Agent D-13, Spark Stevens of the Navy and Yarko the Great. All were Sunday only features, with the exception of Blue Beetle which also had a daily. Fox Feature Syndicate, New York, will release four daily adventure comic strips this month, all creations of V. S. Fox, editor, the syndicate informed the column this week. Added to the 30 features now distributed by FFS, the features will be called "The Green Mask," "Spark Stevens," "Patty O'Day," and "Secret Agent." Comic strips change in style as do many other American newspaper circulation building features and to­day the trend is toward the adventure type of comic because of its wide ap­peal to newspaper readers from six to 60. 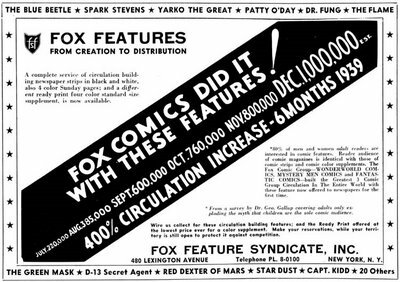 That's the firm opinion of Vincent S. Fox, president-editor, Fox Feature Syndicate, New York, who has some strong evidence in the form of circula­tion figures to prove his contention. This column saw some of them this week. Without fanfare or any great pub­licity, Mr. Fox, a newcomer to the syndicate field (he started six months ago), organized a group of adventure comic monthly magazines (Wonder-world, Mystery Men, Fantastic), sensed (it appears) what the public wanted, and bringing to play his knowledge of retail and merchandising methods ac­quired in years of bank underwriting on Wall Street, built the group's net circulation where it today stands over a million monthly. This is a neat 400% increase, using as the base the 190,000 figure chalked up by the first issue (May, 1939) of Wonderworld. Mr. Fox created Mys­tery Men in August and the first issue of Fantastic now is on the stands although it is the December issue. Mr. Fox explained that comic monthlies work two months ahead. Now, believing that his circulation figures are proof of their popularity, Mr. Fox now is offering the more popular of his features to newspapers. He told the column FFS has pre­pared for release Dec. 3 a four-page, eight-comic ready-print Sunday sup­plement in four colors. 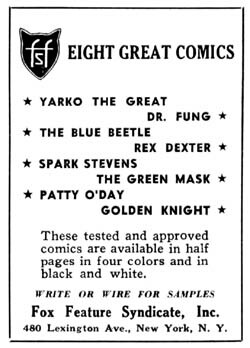 The comics include: "The Green Mask," "Patty O'Day," "Dr. Fung," "Yarko the Great," "Rex Dexters of Mars," "The Golden Knight," "Tex Maxon," and "Spark Stevens," all features being polled by FFS for reader popularity. These can be serviced in black-and-white, he added. 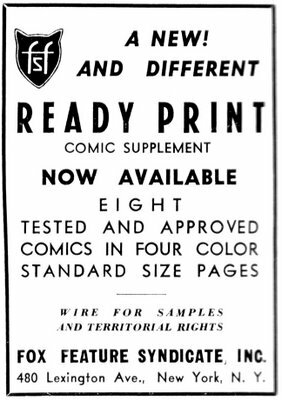 In addition, Mr. Fox said, FFS will release this month to newspapers four daily comic strips, "The Green Mask," "Spark Stevens," "The Blue Beetle," and "D-13 Secret Agent." These are black-and-white. Of FFS's 70 comic features, the column was told, more than 50 are available to newspapers. 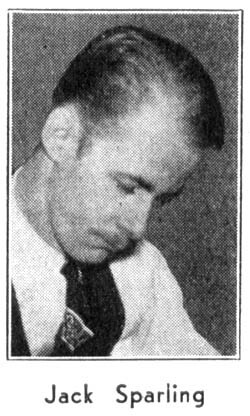 The FFS chief, who entered the publishing business in 1936 with a monthly, World Astrology, worked in Wall Street for 20 years. Born in Not­tingham, England, he came to this country as a child and has always lived in New York. He attended Brown University for one year. 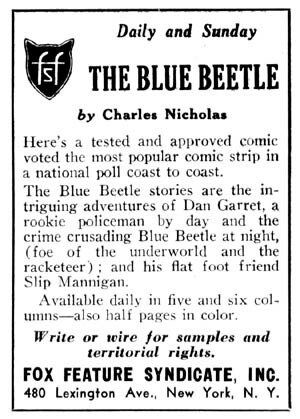 Fox Feature Syndicate last week announced that "The Blue Beetle" is now available for immediate release in five and six column strips together with a Sunday half-page in four-color and black-and-white. 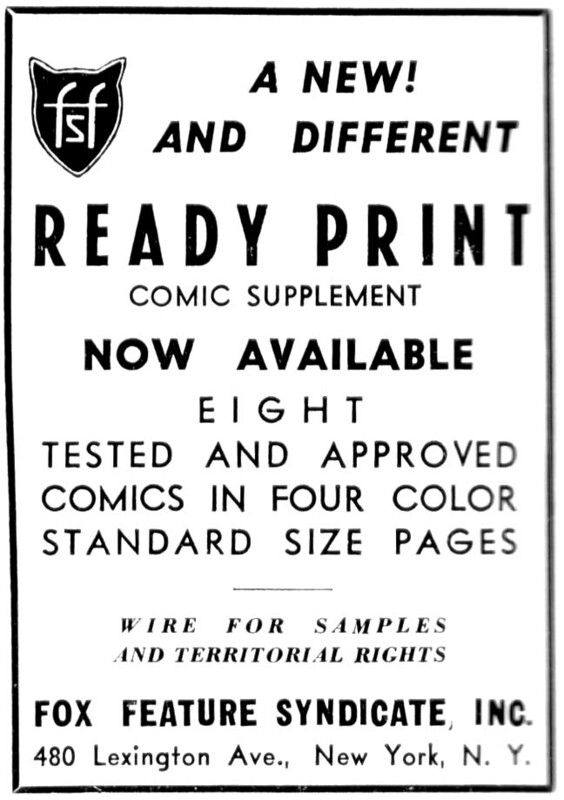 The feature is six months old and is one of FFS's tested strips. It is now being made available for the first time to newspapers. Fox Feature Syndicate this week announced they are now distributing on exclusive franchises and territorial rights, the new feature in half-pages for Sunday only of "Samson," by Alex Boon. 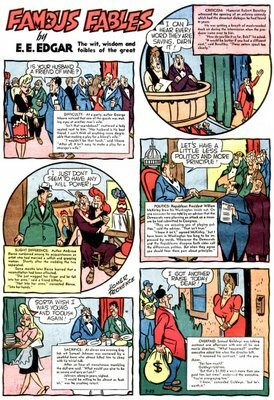 The daily feature, now being produced, will be ready in January 1940., in five and six column strips, it was said by FFS. 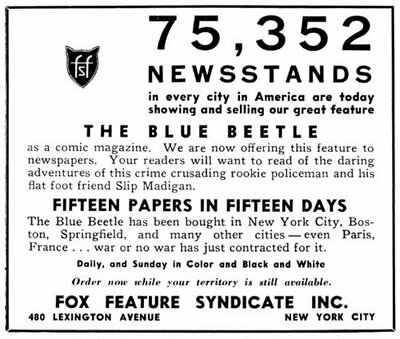 The Fox Feature Syndicate has announced that due to requests from various newspapers throughout the United States, it has agreed to include the Blue Beetle Feature in its comic supplement, Comic Pages Weekly. The AP Feature Service will start off the new year with a new comics panel, "The Doolittles," by Quin Hall, M. J. Wing, editor, announced this week. It will make its first appearance in more than 90 newspapers on January 1, he said. According to the Feature Service, "The Doolittles will be a cartoon history of a typical American family. Rather than a collection of nostalgic tintypes from the old family album, the feature will be a candid cartoon folio of the doings of modern middle-class people." Hall, creator of the new AP feature, is a native of Lacon, Ill., where, as a youth, he had his first taste of newspapering as junior reporter and typesetter on the local weekly, after high school hours. 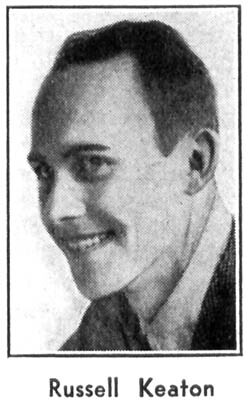 Following an absence of two years, during which he studied and shoe clerked, he got into the newspaper business again on the Oklahoma City Times. Two years after he joined the paper he was made sports editor. After further study at the Chicago Academy of Fine Arts he joined the art staff of the Chicago Daily News, and thereafter did sports and political cartoons and a wide variety of feature assignments in many parts of the country. A new cartoonist, Ralph A. Kemp, Morristown, Ind., free-lance, will be introduced to the national syndicate field Dec. 11 when his daily one-column panel, "Tode Tuttle," lovable old character who will express the homely humor of the Indiana Hoosiers, will be serviced by the Jones Syndicate, New York, Paul Jones, president, told the column this week. Promoted only with the past fortnight, Mr. Jones said, the feature already has been bought by the Kansas City Star, Detroit News, St. Louis Post-Dispatch, Omaha World-Herald, Philadelphia Record, Indianapolis News and Peoria (Ill.) Star, and others. Kemp, Mr. Jones said, has signed a 10-year contract with the Jones Syndicate. 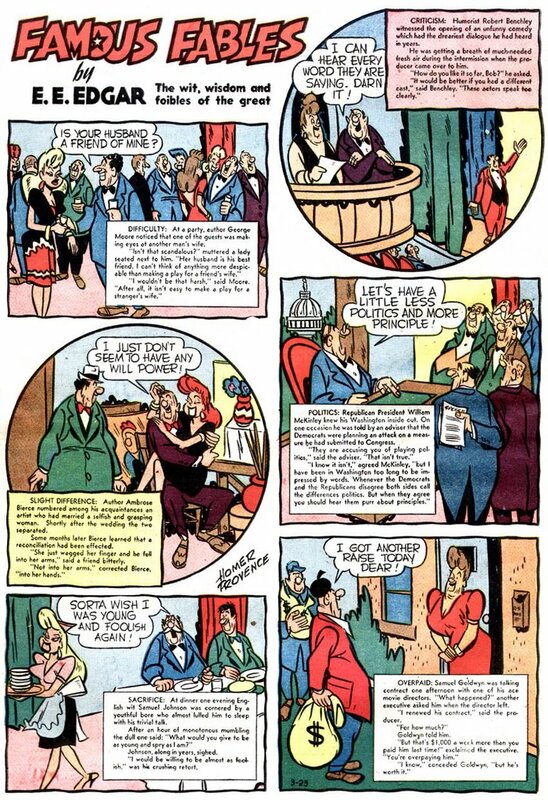 A new daily comic strip based on the adventures of a Washington correspondent, created by the "Washington Merry-Go-Round" columnists, Drew Pearson and Robert S. Allen, was announced this week by United Feature Syndicate. The new feature, bearing the title, "Hap Hazard," is expected to be released Feb. 1. It will be drawn by Jack Sparling, a former staff cartoonist for the Washington (D. C.) Herald, his first comic strip effort. UFS describes the new feature as a humorous continuity strip about a fictional young newspaperman amid the glamor and comedy of the nation's capital, where he meets real, factual individuals whose names make newspaper headlines. It will be the first comic strip to use the actual names and pictures of famous persons as regular characters, according to UFS. Pearson and Allen conceived the idea for "Hap Hazard" as an outlet for numerous stories they are unable to get into their daily column of Washington news. In addition, they both have had dramatic careers, and long have felt the itch to fictionize some of their own experiences. Captain Bruce Bairnsfather, creator of the world-famous comic character, "Old Bill," during the World War, will do a new series of Old Bill and a new character, "Young Bill," his son, Bell Syndicate announced this week. Today, as in 1914, Bell again has acquired the American syndicate rights for the feature. The feature, for release once a week, will be a three-column panel. The locale for its action will be divided between London, where Old Bill is an Air Raid Patrol warden (he's now too old to fight) and "somewhere in France," where Young Bill is with His Majesty's Expeditionary Forces. I have scanned in a dream sequence from the same weeks the second and third week of the Spirit daily ran, in which the girl reporter who was also in the strip dreams she meets Hitler and Mussolini. Know it? Assuming you're talking about Hap Hopper, most likely not. I've read a short run of the strip and found it to be surprisingly lacking in quality, given the big names associated with it. The plot discussed in this article, of using real Washington news in the strip, sounds like an interesting twist, but I don't recall in my limited reading of the strip that twist getting any use. Not really surprising that the strip got a lot of initial sign-ups but then lost papers fast after the first year or so. "Flyin' Jenny," created and drawn for Bell Syndicate by Russell Keaton, made its initial appearance as a Sunday half-page in colors on Nov. 5. The comic had been appearing in newspapers as a daily strip since Oct. 2. The feature is a new type of adventure comic, and centers around a pretty girl pilot. The Sunday continuity, Bell announced, will be different from the strip, its theme being Jenny's adventures in trying to crash the national air races. Keaton, Jenny's mentor, has been drawing for newspapers for the last 11 years, and formerly did the art work on the "Skyroads" strip, and the "Buck Rogers" page. He is a graduate of the Chicago Academy of Fine Arts, and has been drawing since he was 18. A resident of Corinth, Miss., Keaton spends a great deal of his time around airports and pilots and is himself a student pilot, needing but a few more hours of solo flying for his pilot's license. The column is supplied in five or six columns for daily release. To Keaton's great satisfaction, it is also appearing in his hometown paper, the Corinth Corinthian. 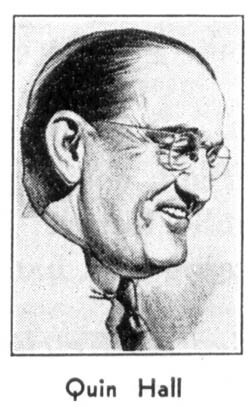 George F. Kearney, president of the Philadelphia Public Ledger, and manager of the Ledger Syndicate, announced this week that the syndicate's comic strip, "Somebody's Stenog," created by Alfred E. Hayward, who died July 25, would be continued, except for the Sunday page. The strip will be drawn by Sam Nichols, who had been doing the strip for daily publication while the late creator had been ill. Mr. Hayward, however, had continued to do a Sunday page during his illness. Walter C. Hoban, 49, creator of "Jerry on the Job'" and widely known cartoonist, died Nov. 22 in New York. He started on the old Philadelphia North American and had his first cartoon printed when the sports desk accepted a baseball game sketch in lieu 'of a picture. He then joined the New York Journal and then King Features Syndicate. 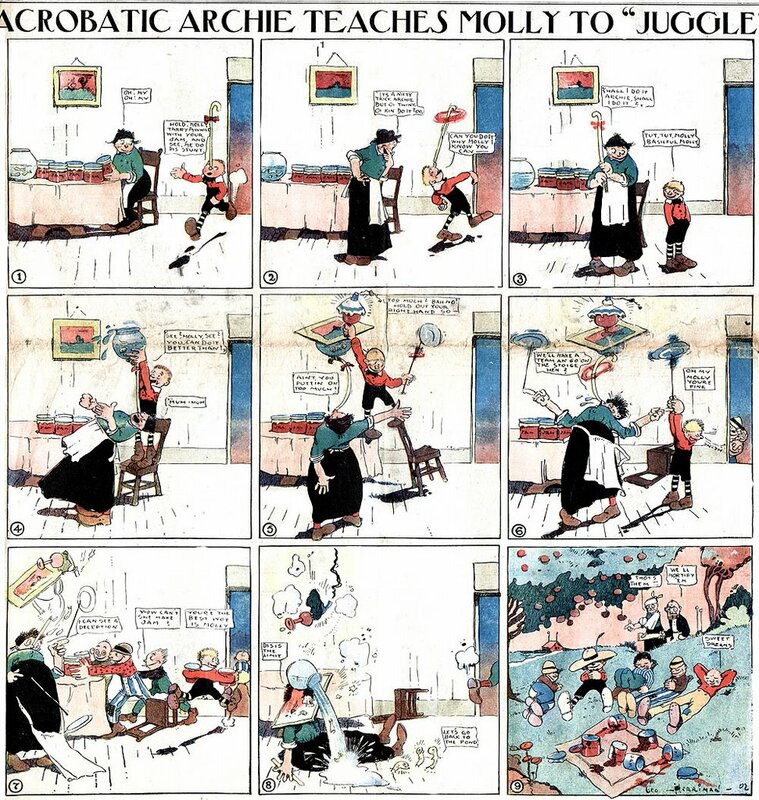 Besides the "Jerry on the Job" cartoon which he created in 1913, Hoban also drew the exploits of "Soldier Speerens U.S.A.," "Jerry McJunk" and a number of other comic characters. He continued his work during the World War in which he served as a second lieutenant, drawing a weekly cartoon. His wife, two children and four sisters survive. George W. Rehse was George *Washington* Rehse. "Sergeant Stony Craig," the hard-boiled leatherneck of the comics, has been recognized by the U. S. Marine Corps, and is now the proud possessor of a warrant appointing him an honorary Gunnery Sergeant. The appointment was issued to Frank H. Rentfrow, creator of the character, with Don Dickson, for Bell Syndicate. A new feature that is winning its spurs in Colorado is "Colorful Colorado," a two-column cartoon about things that make Colorado one of the most colorful states in the Union. It was started last June by Ralph C.Taylor, city editor of the Pueblo Star-Journal, and Jolan Truan, artist on the same newspaper. Now many newspapers of the state are using it regularly. "Colorful Colorado" deals with history, scenery, personalities, incidents - anything interesting and factual that has a Colorado angle. Usually three things are featured in each cartoon. Because of a change in the meat inspection law, the department had revoked the license of Chet Shafer, president of the Big-Link No-Kink Pure Pork Old Fashioned Pennsylvania Dutch-Hickory Smoked Sossage Co., of Three Rivers, Mich. Shafer, correspondent for the Detroit News and other papers, and grand diapason of the Guild of Former Pipe Organ Pumpers, owns a recipe for delicious sausage, which he makes for his friends each winter. He was forbidden to ship his sausage in interstate commerce. "Wars have been fought and thrones toppled over issues of much less consequence and I am heading an individual rebellion whether anyone joins me or not." "After all, this isn't regulating commerce; it is regimenting art," Editor Waymack agreed. The cartoonist wanted to hire Shafer to go into the sausage business, and Mr. Waymack wanted to form a corporation. However, these steps weren't necessary, for Dr. E. C. Joss, of the department, reconsidered, and notified Shafer he could keep his permit, and all concerned are satisfied. Jolan Truan was my father. I have examples if you'd like to see some. He and Ralph did a book in the 50s too. I am Ralph's grandson and would love to the examples you have. E-mail me at vtruan@gmail.com and I will scan some for you. Your Grandfather gave me a number of them and My dad saved a number of them too.